The Unicorn-Eater. Exploding with awesomeness on May 15th! 1. Weird monsters-Primarily I’ve been using some ideas from mythology and then pumping them full of steroids and crazy juice. One thing I’ve been playing around with is the concept of what I call “Pretty Ones.” These being creatures in fantasy tales that usually represent innocence and majesty, such as pixies, unicorns, and the like. But I’ve warped them into not always being as friendly as they appear. 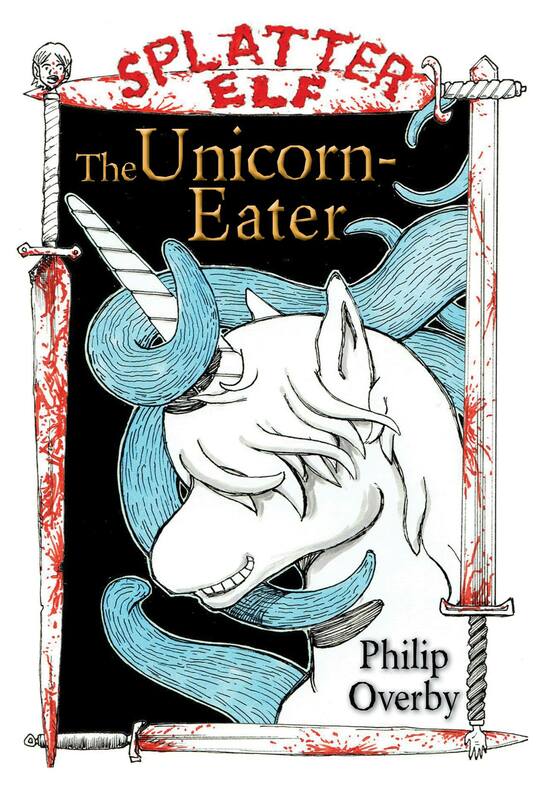 This comes into play in my first official Splatter Elf title for sale, a short story called “The Unicorn-Eater” (for sale staring May 15th on Amazon!) I just have always liked monsters in my fantasy and I’ve seen a trend recently with fantasy that focuses more on humans and their experiences. While I like those stories too, I’m growing more interested in tales that involve strange creatures and how to deal with them. 2. Chaotic magic-My magic system evolved from the idea of “named spells” something I always liked from Dungeons and Dragons. Stuff like Bigby’s Crushing Hand or Melf’s Acid Arrow. These kind of derived from Jack Vance’s stories, so I thought that was a fun way to pay tribute to something I loved from my youth. The “named spells” in the Splatter Elf world are often pretty ridiculous and have really long names. However, I kind of love that about them. Plus, magic comes from teeth. Yes, teeth. So wizards are born with spells ingrained in their teeth. When they’re children, they have “baby spells.” Then over time those teeth fall out and disintegrate, in which they can never be used again, Then their “perma-spells” come in. However, since people are often jealous they can’t use magic as well, there are warlocks and witches in the world that operate as dentists. They find wizards, beat them up or kidnap them, and extract their teeth. They can then smash the teeth to release the spell as one time thing. This makes wizard teeth highly sought after and increasingly rare. 3. Focus on Modern Language-While I know a lot of people hate modern language in their fantasy tales, my stories actually take place in the year 15,000-something. So that means it’s the future, right? People still use swords and magic though. And some nations even used guns and hulking mechs in the past, but most of those civilizations lie in ruin after years of constant wars. So the chance to get back the technology certainly exists, but it doesn’t look like it’s happening anytime soon. So in that regard, my characters often talk like people would talk today. They just happen to use magic and swords. This allows my natural voice to shine through and since I’m writing humor, I think I can get away with doing different things. 4. Shorter Self-Contained Work-This is a personal choice that has a lot to do with years of failed epics sitting on my desktop begging to be finished. In this regard, I think Splatter Elf lends itself more to shorter, pulpier kind of stories. This doesn’t mean I’m ruling out doing a series. In fact, I hope it eventually leads to that. But for now I’m going to be writing self-contained shorts stories and novellas that can be theoretically read in any order. Once I get an idea of what readers like, then I’ll focus the content in that direction more. I’m a “give the readers what they want” kind of guy, so I’m interested to see how this goes. All in all, I’ll be posting a lot about this process as I continue onward. There is a Splatter Elf tab at the top of the page that you can click where I’ll be adding a crude as hell map and more information about the countries and history as time goes on. So keep an eye out for that. Good job, Phil. Sounds fun and intriguing. Keep the faith! Hi Philip, I didn’t realise Splatter Elf started with the A-Z Challenge! Good luck with your new venture! Yeah, I’d actually like to get on board with another blog challenge sometime soon. I’ll have to keep an eye out for one.